Sheriff of Yessingham | SPACE-BIFF! Imagine yourself sitting at a table with your family. If you don’t have family, imagine sitting at a table with friends. If you don’t have either, I’m sincerely sorry I brought it up — imagine yourself some friends and a family, and imagine you’re all sitting at a table. In your hand, you’ve got six cards. Four of them have green borders: two chickens, a cheese, and a bushel of apples. The other two are red: a jar of pepper and some Gouda. You’re a merchant, and these are the goods you can take to market. A green border means they’re legal, while red lets you know they’re contraband. Sitting across the table, imagine your most intimidating family member. Maybe your father-in-law (who never really approved of how you stole away his little angel), or maybe you’ve always had a strained relationship with your mother, in which case picture her. Maybe your little sister came along and you felt replaced and you never really came to terms with it, so pick her instead. In this imagination-moment, they’re playing the Sheriff of Nottingham, determined to make some quick cash by either catching you bringing contraband into the kingdom or by extorting a bribe. They’re staring at you with hungry eyes, trying to figure out what sort of cards you’re holding, straining their memory — was it apples you picked up last round, or bread? “Three cards,” you say. 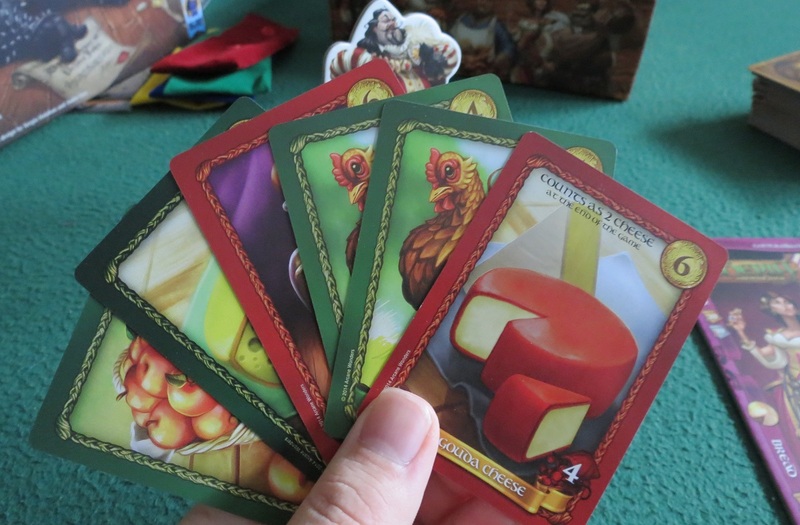 You remember that neither of the discard piles have anything you want, especially since you want to be the Cheese King at the end of the game, and one of your family members has been after the same distinction and you really don’t want to come in second place as the Cheese Queen. For one thing, it sounds stupid. For another, a Cheese Queen gets fewer points than a Cheese King. You turn in your three cards to one of the discard piles (two chickens and the apples) and draw blind from the main deck. Another apple (damn it), a cheese (excellent), and a crossbow (contraband, obviously). With the Sheriff-slash-family-member’s eyes still on you, you crack the slightest smile, then force it from your face when you look up. Of course it was a ruse. On the inside you were saying swear words. Then, with your face carved out of stone, impassive, unreadable, you load four cards into your little purple bag, snap it shut, and hand it to the Sheriff/father-in-law. “Four cheese,” you say. Maybe one day, you could be the Cheese Queen! Every game of Sheriff of Nottingham comes down to a number of these agonizing will he or won’t he? moments. The Sheriff lifts your bag, sniffs it. Makes some silly comment about how it doesn’t smell like cheese, so you promise it’s cheese. No really, can’t you smell it? It’s like, uh, cheese whiz. “Gouda cheese?” the Sheriff asks. You freeze, but only on the inside. “Regular,” you insist. The Sheriff reaches out to hand your bag back — you’re breathing out a sigh of relief as you reach out to take it, because the only moment that matters is the snap of the bag. If you open it, you’re safely past the Sheriff’s inspection checkpoint and you get to lay out what you’ve successfully smuggled. But if the Sheriff opens it and you’ve got contraband in there, then the offending goods are discarded and they charge you a fine. Unless, of course, the Sheriff opens it and you were telling the truth. Then he’s the one who has to pay the fine. But that isn’t the case this time. “You can’t do that!” you exclaim, a little too loudly. “We agreed we could last round,” another family member reminds you, voice exaggeratedly disinterested, pretending to clean their fingernails or something. You remember; but that little ruling was so fun when you were bribing the Sheriff (someone else at the time) into inspecting someone else’s bag. It isn’t fun now. “Done,” you blurt, and before the Sheriff can reconsider, you’ve plucked the bag from his hand and tossed a five-piece across the table in his general direction. You snap the bag open and proudly lay your cards on the table: two cheese face-up, added to your growing stack of cheese cards; and two others face-down in your contraband stash. “I told you so,” says the person who tried to bribe the Sheriff into catching you. Not that their snark phases you in the slightest. All you can feel is relief, because you got through. Nobody will find out what those contraband are until the end of the game, except for you. In this case, a crossbow and some Gouda, good for two cheese at the end of the game. This time, nobody’s keeping you from being Cheese King! And really, that’s all there is to Sheriff of Nottingham, a series of perfect moments on repeat, permuted to fit every raised eyebrow, every remembered lie, every paranoid fear that you’re about to open a bag that’s filled with legitimate merchandise. It’s a brilliantly slim game of bluffing, observation, and a little bit of hand management. There are few things in this life as pure as lying to your loved ones and not having to feel guilty about it, and Sheriff of Nottingham delivers that feeling in spades. 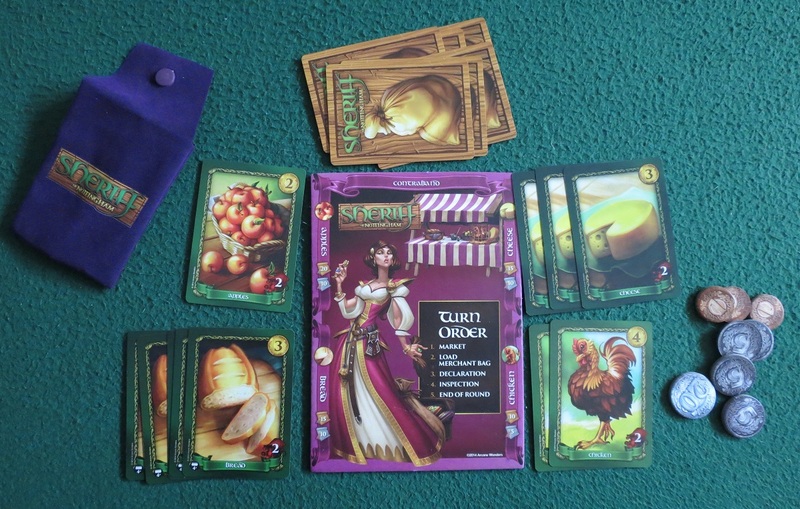 Posted on August 25, 2014, in Board Game and tagged Arcane Wonders, Board Games, GenCon Loot, Sheriff of Nottingham. Bookmark the permalink. 9 Comments. I’d heard this was good, and this sold me. Sounds fantastic! I can’t get enough of solid bluffing games. Yeah, I think I’ll have to get this one. I do so enjoy bluffing and lying to my family when we play games. So do my family, that’s why Avalon, Coup and Love Letter are so popular with them. I think this is the perfect review of this game. Will teach the game by simulating something similar in the future. Pingback: Best Week 2014, Day Three! | SPACE-BIFF! Pingback: At Least Prohibition Gave Us This Game | SPACE-BIFF!